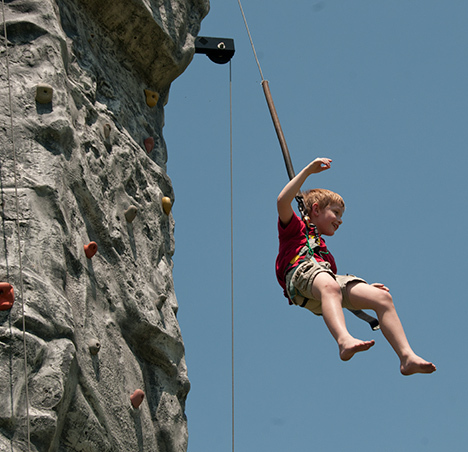 Though he could probably care less, from his lofty height at the Felsenthal Bream Fest rock climbing attraction, this boy can probably see competing anglers and their boats as they dangle crickets and other baits for their finny prey. The boy, after a couple of tries, made it to the top and "rang the bell." He is on his way down now. 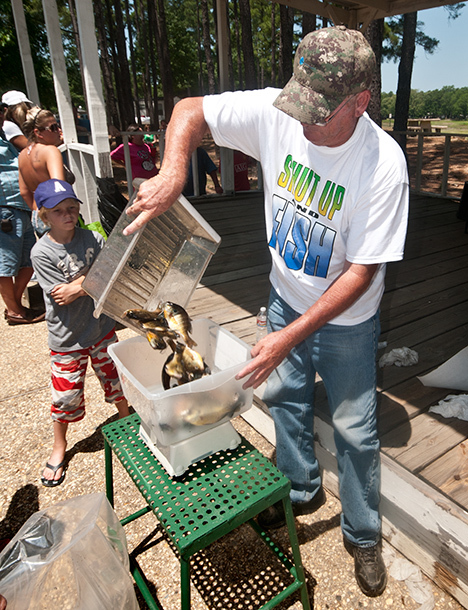 Families and fishing enthusiasts descended in droves on Felsenthal, Arkansas for the 2011 version of the town’s Bream Festival and Tournament, May 27 and 28. The town sits next door to the Felsenthal National Wildlife Refuge which has some fine camping facilities, all of which were occupied. There is one small motel in town, Tracks Inn, which was at capacity. Otherwise you needed to figure some driving time into your festival plans. At this point in this epistle, may I suggest that you to to the Photo of the Week page at Corndancer dot com and see pictures and read where this story started. We’ll wait here. Eighty two boats were registered for the tournament, a good turnout, I was told. Most of those boats had two competitors aboard. Winners were determined by the team weighing its heaviest 20 fish. See more Felsenthal fishing and festival pictures in our Weekly Grist Gallery. At the weigh-in, the heaviest team catch when the time I was there was 8-1/2 pounds which figures out about 6.8 ounces per fish, not too shabby, but not a record breaker. The Felsenthal National Wildlife Refuge is 60,000 acres of wetlands, heavily populated with Tupelo and Cypress. Due to recent flooding conditions, the water was higher than usual so many boats were floating where they would normally be high and dry, or at least running aground. 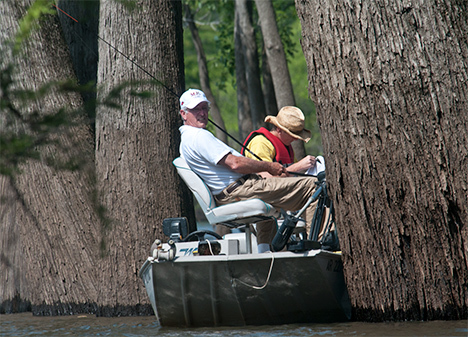 This team (and others) took the opportunity to navigate around submerged old growth cypress. The trees are huge and apparently the fish like the neighborhood. Other teams were fishing close-by. Noticeable among the teams were husbands and wives. Perhaps the family that fishes together stays together. In this case, the hubby is being the good guy as he unhooks a bream his spousal unit has just landed. The festival was not all about fishing, though that is the reason for the event. The Felsenthal Bream fest had what you want and expect at such a happening: food and merchant vendors, arts and crafts, a Gospel “sing,” a water slide, the rock climbing doo-dad you see above, a beauty pageant, and a “street dance” in the town’s covered pavilion. With all of the Memorial Day and festival attendees, the “street dance” in the pavilion was a prudent idea. Helps hold down 911 calls. 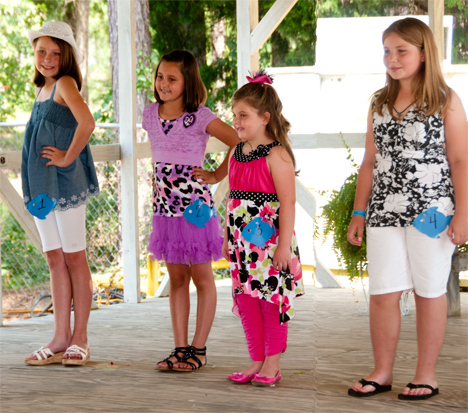 Pageant contestants show their stuff and best smiles. There were stair-stepped categories from "brand-new" to 18-year-old-girls. The pageant is a popular part of the festival. Hungry bream will bite at nearly any thing that looks edible. They love crickets and worms, but will also grab a “poppin’ bug” and a “bream killer” presented with a fly rod. The popping bug floats and the bream killer sinks. It’s not unusual for an angler to catch two fish at one time with a “y” arrangement of a popping bug and a bream killer. Such an event is pandemonium defined. In this environment, however, fly rods would not work well. I mention them because any discourse on bream fishing that does not mention a fly rod should not be taken seriously. It's not his first rodeo, He has a first class cricket cage for probably the bream's favorite live bait. Catalpa worms may be a close second when you can find them. I told this guy when I shot the picture that the whole world would be able to see him with his hand in a cricket cage. He seemed to enjoy the idea. This was a family outing. You can see his dog. His wife was off camera in the back of the boat. 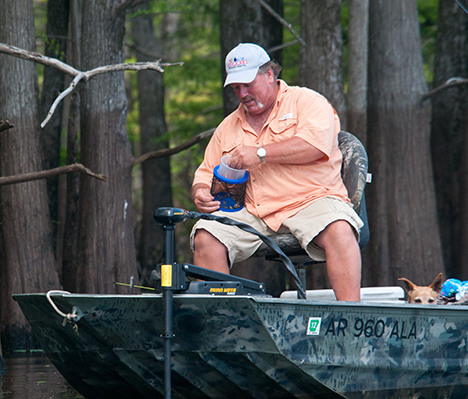 The midday weigh-in was creeping closer and anglers headed to the ramps to make the deadline with their catches. We wisely took our boat out slightly ahead of the main crowd. My skipper and crew for the day were my friends of long-standing, Linda Newbury, Mayor of Felsenthal, and her husband Jack Newbury, a member of the Felsenthal town council. They are avid anglers and know the waters around Felsenthal like the back of their hands. See more Felsenthal fishing pictures in our Weekly Grist Gallery. The lying stops here. The weigh-master dumps a catch of fish on the scales. This one raised no eyebrows. When he announces the weight of a heavier catch, "oos" and "ahs" rise from he crowd. The small town of Felsenthal and its people do good job with their festival, proving again, that you don’t have to be big and you don’t have to have an unlimited budget to do good things. But you do have to have a good idea and be prepared to drip a lot of sweat in the process. The folks at Felsenthal have both down pat. 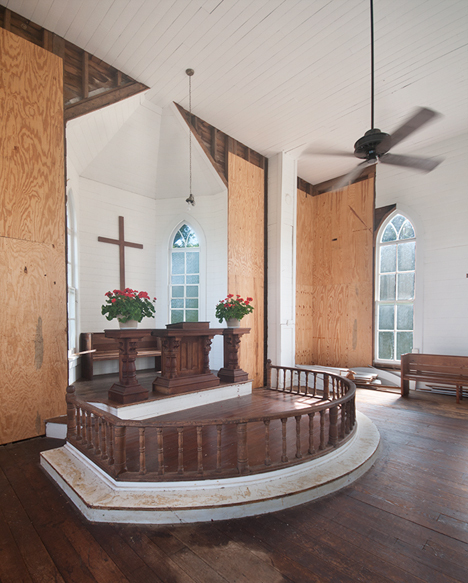 Most of the inside trim, pews, room partitions, and balcony were removed from the Selma Methodist Church building when work started to rebuild the foundation. The church was jacked up eight feet in the air to facilitate foundation reconstruction. Fortunately for us, the pulpit appurtenances were spared the ignominy of storage. What you see was hand carved and is in very good condition. The patina of the floor comes from more than 130 years foot traffic. Most people believe it was never painted or shellacked. The inside of Selma Methodist Church at Selma, Arkansas looks a bit disheveled right now. So would you if you had your innards nearly turned inside out by the back sides blows of Hurricanes Gustav and Ike. See more Selma pictures at Corndancer dot-com. The church building, completed and first used in 1874 and narrowly escaping that disaster, has undergone some serious work for stabilization since that fateful March in 2008 when the storms nearly pounded it into the ground. You can get more details on the start of this story at the Corndancer dot-com Photo of the Week page. We’ll wait here while you look. 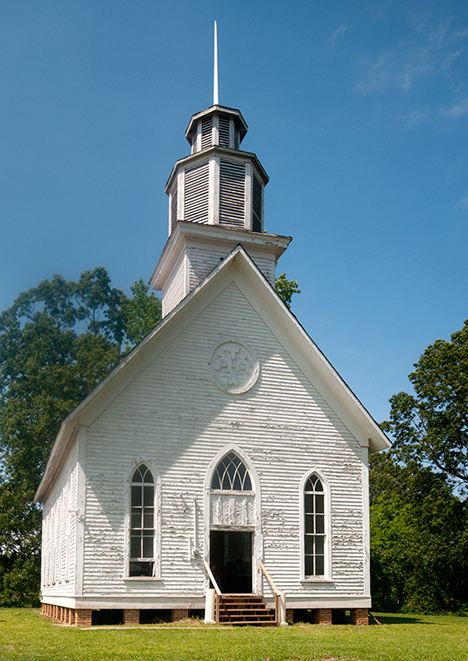 You can see pictures of the complete church interior and read a recent article detailing the church history were published in the December 2010 issue of Rural Arkansas, the official magazine of Arkansas Electrical Cooperatives. The fine southern cuisine prepared on the grounds before your very eyes went fast. The cooks were efficient and nary a soul went hungry. Gets one in a generous mood. The storm damage to the church was so severe that it was declared unsafe for any events and/or any entry for other than maintenance, and then at extreme risk. This fundraiser was the first event held in the church since the storm damage in 2008. Previously, it was frequently used for weddings, funerals, and other events. Even attendees took turns ringing the church bell, a welcome sound to the community. It is said the bell was cast with 100 silver dollars melted into the metal before the pour to improve the sound. To my ears, it worked. Selma Methodist Church, May 21, 2011, the first day it was open to the public since the storm damage in March 2008. See more pictures of the Church and the fundraiser event in our Weekly Grist Gallery. Part of the fund raiser was an auction of donated items. 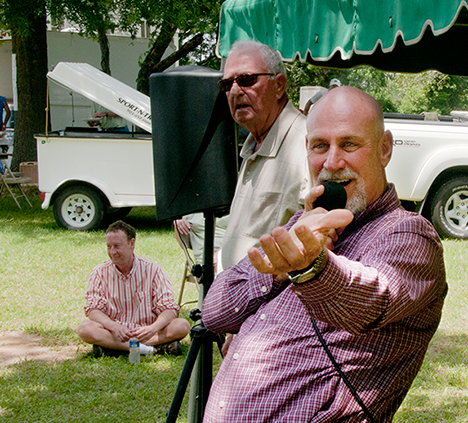 The auction was conducted by guest auctioneer, Mark McElroy, County Judge of neighboring Desha County, Arkansas. For non-Arkansans, the title “County Judge,” in Arkansas is an executive title rather than a jurist title. The position is roughly equivalent to what folks in other states would call a county mayor. Judge McElroy, a man of many talents is one of those individuals who has never met a stranger. He kept the crowd entertained. Judge Mark McElroy works to pry extra dollars from a bidder, while his "Vanna White, Mr. Riggins (sunglasses), watches the action. 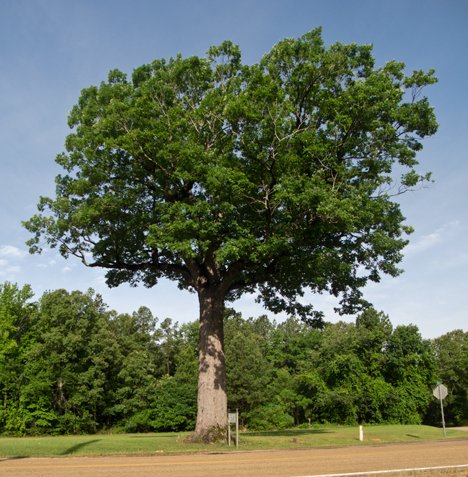 The trip to Selma took me through the Coleman community where you will find the “Look-See Tree,” a fine White Oak on the premises of Olin Tucker. The tree is designated as an Arkansas Historic Tree. Olin Tucker's Look-see tree with full summer foliage. Meandering around, we find stuff that makes us smile. We presume this is the right stuff to make you smile as well. Driving north on Hwy. 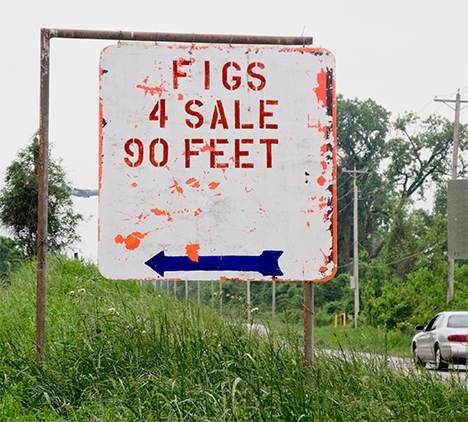 70 after our junk yard adventure a couple of weeks ago, we saw a home-made sign promoting fig sales. Being curious, we followed the area to discover that not only could one purchase figs, you could also drive away with a new dog house. If you are looking for figs, this is the place. The sign appears to be a recycled day-glo highway warning sign of some sort. Adaptive re-use, I believe, is the term. 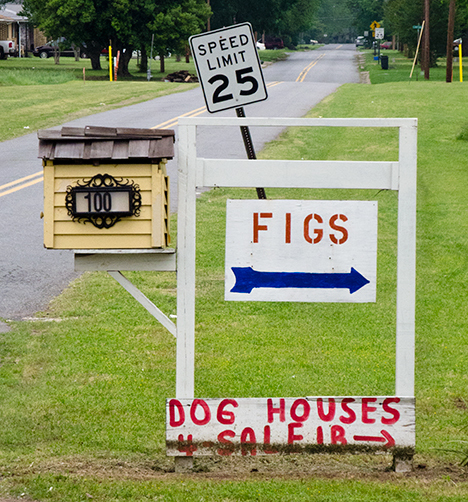 Once you cross the railroad and levee which comprises the 90 feet between the first sign and entrance to the fig emporium, you discover that, as a bonus, you can buy a dog house as well. Diversification is a good thing in business these days. See our Weekly Grist Gallery, this week with 55 pictures of the Selma Church Fundraiser event. See Pepper the Schnauzer in this gallery, the one and only Schnauzer to attend the Selma Methodist Church fundraiser. Well socialized, he fit right in. 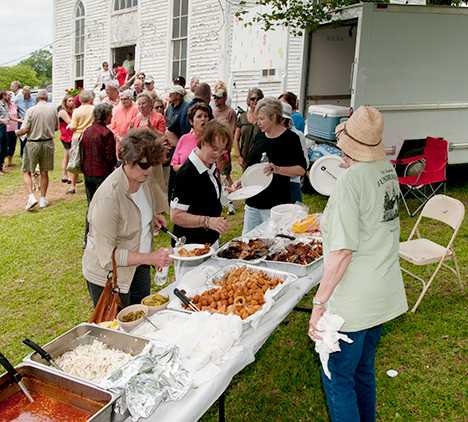 There you will also see more pictures of the church, the auction and the musicians as well as the cooks and attendees. This collection is a glimpse at a southern on-the-grounds “git-together” as one should see such an event. Even if you are not an anthropologist you will probably see something you like. 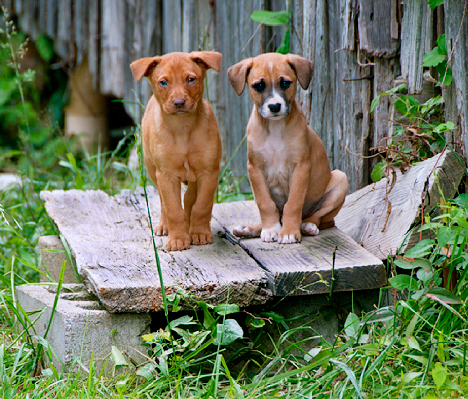 These are Angie Ledbetter’s puppies. The pups’ mother moved them from the Chez Ledbetter to the nearby ancestral home of the Garners, her great grandparents and grand parents. There is one more puppy who was bashful and missed the photo-op. They have a severe case of cute. If you blink, you may miss the Garner Place off Arkansas Highway 128 in the Lonsdale community. The original Garners built the first residence on the place as homesteaders sometime in the mid 1800s. The structure below was built and first occupied sometime between the late 1800s and 1901 according to Myrna Garner, widow of the late Robert “Bob” Garner, who was born in the home, a grandson to the original Garners. His final resting place is on the premises. The Garner Place off Arkansas Highway 128 in the Lonsdale community. The Garner family takes a great deal of pride in their ancestral headquarters. So do their puppies. It’s not every family that has a 110-year-old plus crown jewel of family heritage, where the fifth generation can hang their hat and say, this is where I came from. The late Bob Garner and his wife Myrna had that in mind back in 1974 when they bought the place back. Seems in the early 50s Garner’s siblings were anxious to sell the old place and divide the spoils. There were 300 acres and the house which they hoped would bring a princely sum. The property was auctioned off for less than a third of what it was worth. Before we go much further, may I suggest that you go to the Photo of the Week Page at Corndancer dot-com and see some more pictures of the old home and get in on the start of the story. We’ll wait here. Bob Garner never forgot about the property and always wanted it back. Then in 1974, he got a call from his father who informed him that the people who bought the place were putting it on the market. Garner and Myra lived in Florida at the time, but Garner let no grass grow under his feet. He returned to Arkansas, made an offer and convinced the friendly local bankers to loan him the necessary moo-lah to close the deal. It all came together and the Garner place was THE Garner place again. See more pictures of the house in our Weekly Grist Gallery. 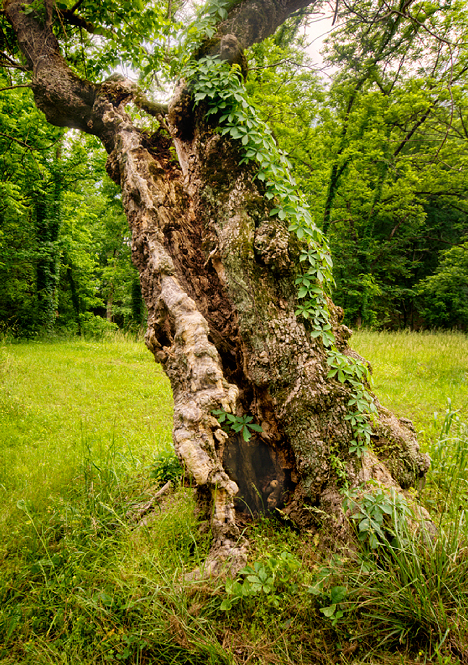 The gnarled old tree at the side of the house, surviving against the odds, is symbolic of the Garner resolve to bring the original family place back into the family fold. The Garners, led by Angie Ledbetter, daughter of Myrna and Bob have plans to stabilize the parts of the structure not deteriorated and repair what is needed. First on the list is to rebuild the porch which they tore out after a friend had an unseemly crash-through on the original equipment. According to Myrna they are scouting for old lumber to maintain the character of the home. Sounds about right from what I’ve learned about the Garners. As we reported on Corndancer Photo of the Week page, the old home site is the Bob Garner’s final resting place. 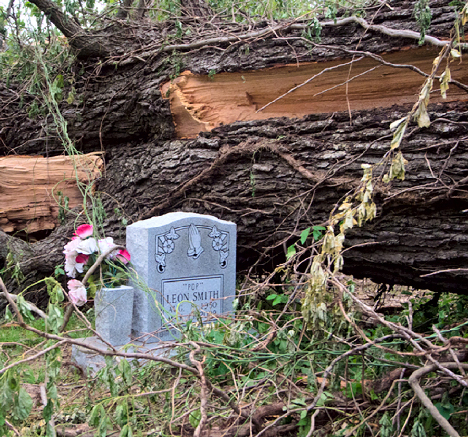 His mausoleum endured a crashing tree during the recent rash of Arkansas storms. The mausoleum survived. A couple of weeks ago, while traveling south of England, Arkansas, we encountered a similar set of circumstances. Both near misses. Perhaps the Almighty is reminding us who is in charge. A near miss at a church cemetery south of England, Arkansas. The Almighty making sure we mere mortals do not forget who is in charge. Very convincing. 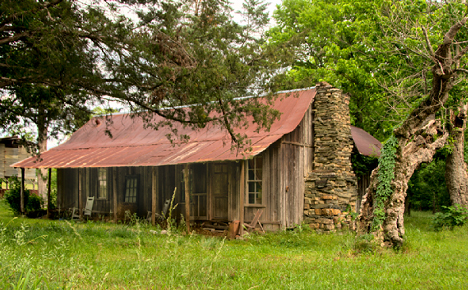 I drove on Cash Mountain Road as I meandered in the direction of the Garner Place and found still yet another old barn. You just can’t see too many. 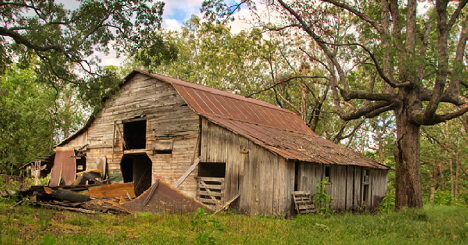 See more pictures of the barn in our Weekly Grist Gallery. 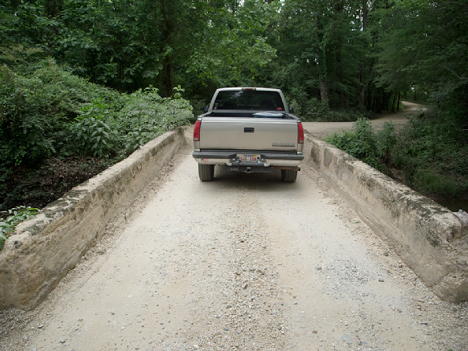 Traveling through the hinterlands of Arkansas and nearby states, one occasionally runs up on some narrow bridges. I found one in Saline County, Arkansas northwest of Glen Rose that takes the record. My truck and a bicycle would not safely nor successfully negotiate the bridge with out grievous personal injury and dings. See our Weekly Grist gallery with more puppy pictures, another view of the tree on the grave, another barn picture and several more pictures of the Garner house. Click and go to see these pictures. Your momma would want you to do this. 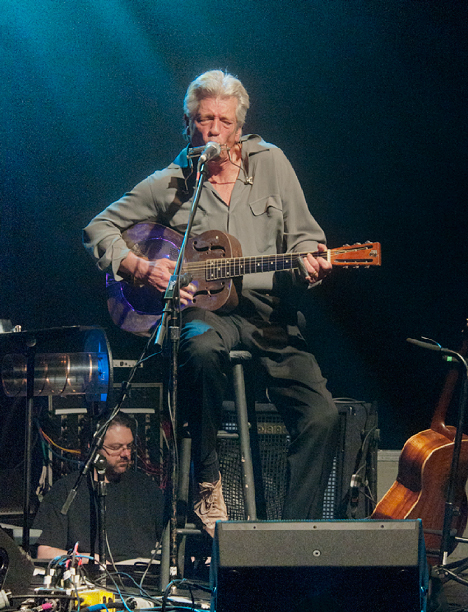 Blues Guitarist John Hammond performs at the 2011 Blues Music Awards in Memphis TN. Not normally seen by the audience is the sound engineer in the pit below the stage. He coordinates with the board engineer on the hall floor. They make the music sound cool. Hammond was the winner of the Blues Music Awards "Acoustic Artist of the Year" award. As one listened to him play, it was no mystery why he won the prize. Once a year, Blues aficionados from around the globe gather in Memphis TN to bestow awards on those whom they believe have eclipsed everyone else in certain categories for the past twelve months. The event is the Blues Music Awards, a function of the Blues Foundation. This year, due to some really good friends, we were a part of that crowd May 5, 2011. The night rocked! Before venturing further, may I suggest that you go to the Photo of the Week page at Corndancer dot-com where this story started and get in on the beginning. You will see pictures of performers Steve Miller and Buddy Guy, along with Smokin’ Joe Kubeck, whose thumbnail picture you see to the left. We will wait here for your eventual return. As would be expected, you saw everything from designer togs to thready jeans, but it being a blues event, that’s exactly what one would expect. The crowd was milling around imbibing and chatting while perusing silent auction items, a staple at non-profit organization events. Attendees were seated 10 to round tables. We were fortunate to be seated with friends who are members of the Memphis Blues Society. Janiva Magness, a former Best Female Contemporary Artist and BB King Entertainer of the year, wowed the crowd with her energetic vocals. She tours with her band and makes around 200 appearances a year. In her spare time she is a foster children advocate. The Steve Miller Band was the opening act. He was followed by the likes of Buddy Guy, the Mannish Band, Janiva Magness, Karen Lovely, Willie “Big Eyes Smith” and a host of other performers. Their acts punctuated the awards and kept the place rocking. 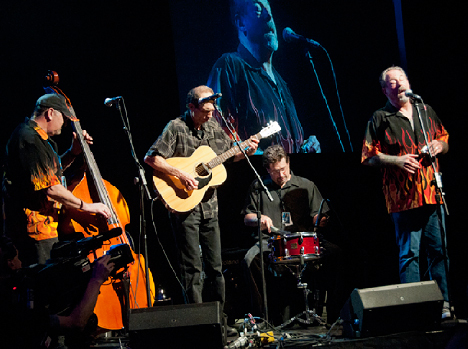 The Nighthawks Acoustic Blues Band,winners of the Acoustic Album of the Year for their "Last Train to Bluesville." They clearly demonstrated why they won. Check out the our three galleries of pictures from the 2011 Blues Music Awards. You’ll see Steve Miller, Buddy Guy and a host of other famous blues performers. Speaking of punctuation, my enjoyment of the performance was temporarily punctuated by a waiter dropping a charger full of plated dinners on my person. I heard this strange noise and saw cheese and macroni, fish, green beens and rib meat, plates and lids tumbling into my lap. The wait staff was about to panic, but I assured them that all was well as I wiped cheese and macaroni from the back of a Nikon D300. Nothing was hurt but my feelings, so I laughed and told them to be cool. Flooded residence on Arkansas Highway 1, north of DeWitt, Arkansas. We were on this road because the White River was over a bridge on I-40. Due to the recent rains that have turned the Delta into a large pond dotted with islands of dry land, we took a detour route to Memphis which added about 45 minutes to the trip. Not too bad. Mostly a pleasant drive through the Delta. The pictures here are on the trip back. Just a bit further down the road, we saw a residence where the owners took matters into their own hands. 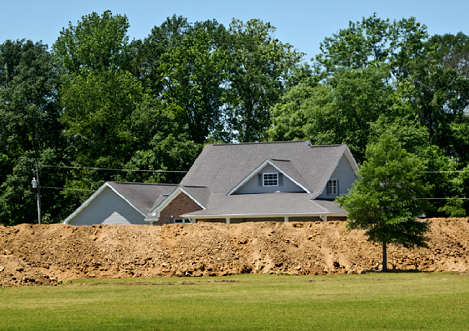 They built a levee around their house and barn which appears to be in the neighborhood of 15 to 20 feet AGL (above ground level). Ready for high water. 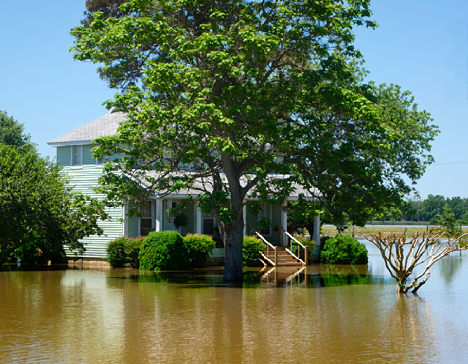 Enterprising homeowners built their own levee. Closeup of your own personal levee. Since this is primarily an agricultural area, people are no strangers to working with dirt and have the equipment to do the job. Driving on, just outside DeWitt, we saw a tall plume of black smoke. If there was a fire, I wanted to see and shoot it. 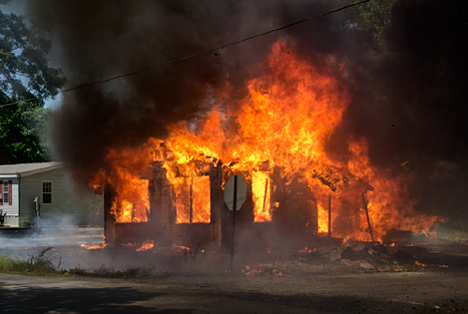 A burning house in DeWitt, Arkansas. I visited with neighbors who told me the fire was set deliberately to destroy the house. We found the fire. After the neighbors told me it was deliberately set, I wondered why. Taking a second look at the flaming structure, I noticed that is was covered with old late 40s asbestos siding. Not a bad idea, but asbestos is not terribly flammable. Good luck folks. Just east of Humphrey, Arkansas on Highway 152, we ran up on a pickup towing a land leveler which was as wide as the highway. Just 25 miles or so from home, we came up behind a land leveler being towed by a pickup. The driver did not notice us at first, but we eschewed honking the horn anyway. He finally saw us and carefully pulled to the right to let us by. I say carefully because that sucker would mow down mailboxes in a heartbeat. A few minutes later, on the final run for home, we were not so fortunate. We came up behind a wide load personified as the dump body of one of those huge strip mine dump trucks which will hold approximately a small town. 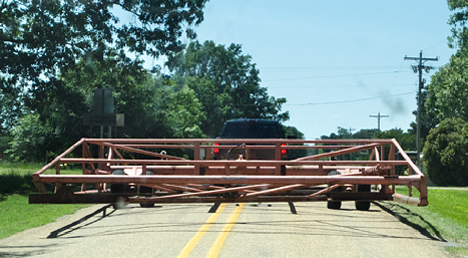 We followed him for about 15 miles when we reached an alternate route. Finally made it home in one piece. The dogs were glad. 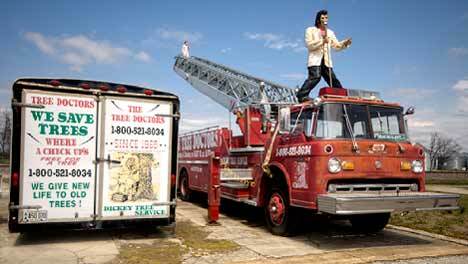 Elvis on Dickey Tree Services fire truck in Portia AR. 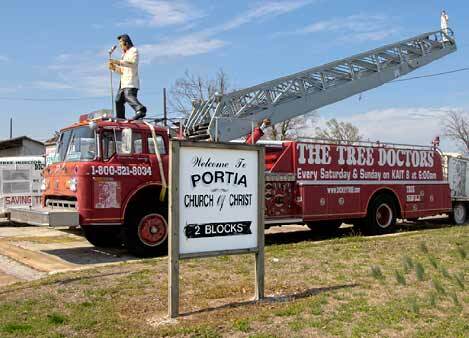 Never before in the annals of mankind has the phrase, “you can’t miss it,” been more appropriate than when applied to the Dickey Tree Services fire truck parked on U.S. Highway 63 in Portia AR. 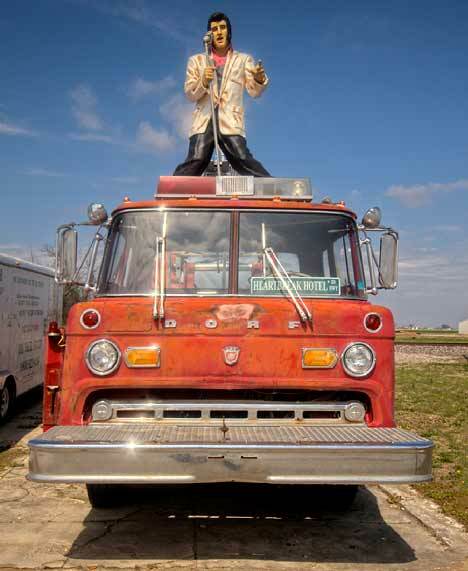 One simply does not expect to see a life sized “Elvis,” holding forth (in silence) from atop the cab of a retired fire truck turned tree services truck. Not in your wildest tequila induced dreams. But when you wheel into Portia AR, population 483, there it is. You are not dreaming. It is for real. See more bizarre goings on at Corndancer dot-com. Before we go much further with this Bizarre and Bizarrer treatise, may I suggest that you go to the Photo of the Week Page at Corndancer dot com and get in on the first part of this bizarre story. You will see what appears to be an old Chevy attempting to open a new drive in at a salvage yard and you will begin to understand the high value of “bizarre” in our society. The business has taken a unique decorative track to grab the attention of passers-by. Dickey Tree Services fire truck complete with "The King." Notice the small "Elvis" perched on top of the ladder. Rain on windshield at Taylor's Auto Salvage. Enough already! 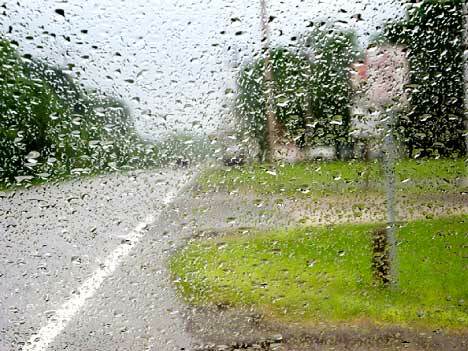 Back in the seventies, the Carpenters, featuring the idyllic voice of Karen Carpenter, created “Rainy Days,” now considered a classic comment on a day like to today, a rainy Monday. See more fire trucks and pictures from Taylor’s Auto Salvage, our bizarre and bizarrer stories of the week, in our Weekly Grist Gallery. Who’s more bizarre, who knows, that’s up to you. If you decide, you can let the world know with a comment below.